Wwe have a customer using a lot of storage (5TB of storage when only backing up 500gb). The cloudberry tech said we had settings wrong and he had us review some documents about Block-Level Backups. I reviewed the documents and have a few questions that maybe someone could help me with. 1.) We are backing up a total of 500gb for a customer, but he is up to 4.7TB in cloud storage. I'd like to try able to restore 90 days worth of files for the customer. 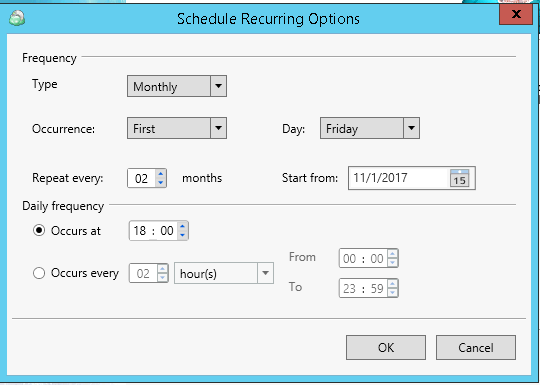 How can I setup cloudberry to save about 90 days worth of files? 2.) To save about 90 days of history, how many full backups should I do? 1 full backup every 90 days? or 1 every 30 days? 3.) Do you have a tool or know a calculator that would show me how many days I could save for a customer with 5TB of storage that has 500gb of data? 6.) since my customer has used up 4.7TB, I want to reset his bucket and start over, what's the best way to empty a Backblaze B2 bucket? The pictures didnt work so im uploading them. 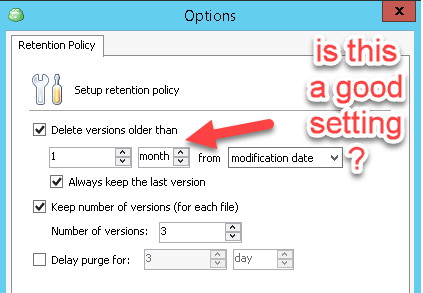 1) You can simply set the software to delete versions that are older than 90 days on the retention policy window. That should be enough. 2) I'd suggest to do full backups as frequent as possible, that should keep versioning consistent. Doing full backup once a week is a good practice. 3) That's almost impossible to calculate, especially for file backups. You need to take into account the size of the files, amount of changes for that data set and the frequency of the plan runs. 4) You might want to disable "keep number of versions" parameter if you want to keep more than 3 versions of data on storage side. Time-based parameters look good. 5) It's up to you, but in general I recommend running full backup once a week, like I previously mentioned. 6) This article should help, the process is automatic, but it will take some time to purge the data. Thanks again for that great info. After making my changes, do i need to delete the bucket or once the policy is applied, or will it auto delete what is needed? We don't delete the bucket itself during this procedure, it will just be empty and ready for deletion on B2 side.